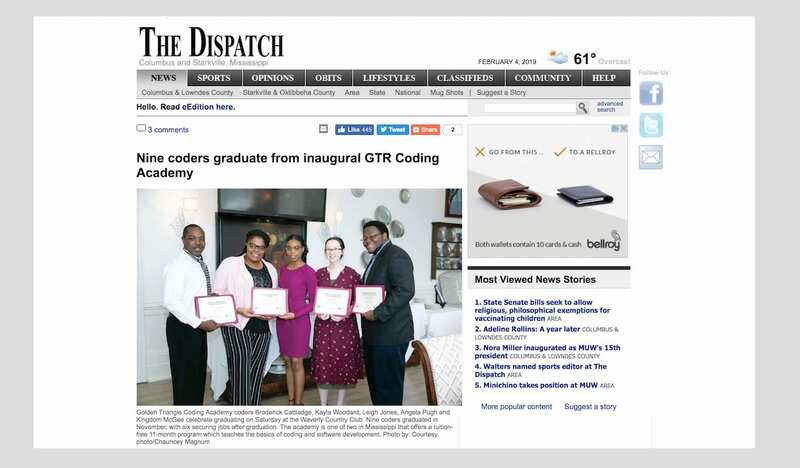 The Columbus Dispatch had two great stories on the Golden Triangle Region (GTR) cohort of the Mississippi Coding Academies in January—one was an announcement of the graduation of nine coders, and the other was an editorial that focuses on the potential that the Coding Academies have for fighting brain drain in Mississippi. In the news story, reporter Mary Pollitiz tells the compelling story of one coder from the GTR cohort, Kingdom McGee, who was forced to drop out of Mississippi State University for health reasons. In their editorial, the Columbus Dispatch editorial board celebrates the graduation of these coders from the GTR cohort and calls on the educational system in Mississippi to take note of the idea that flexibility is an important strategy for addressing new jobs created by technology and turning them into career options for young people who might otherwise be headed for minimum-wage jobs. We thank Mary Pollitiz and the Columbus Dispatch editorial board for these fantastic articles and applaud the GTR cohort on their achievement. For more on the Mississippi Coding Academies, visit their website at https://www.mscoding.org/.